The debate Edward Snowden envisioned when he revealed the extent of National Security Agency (NSA) spying on Americans has taken a bad turn. Instead of a careful examination of what the NSA does, the legality of its actions, what risks it takes for what gains and how effective the agency has been in its stated mission of protecting Americans, we increasingly have government officials or retired versions of the same demanding—quite literally—Snowden’s head and engaging in the usual fear-mongering over 9/11. They have been aided by a chorus of pundits, columnists and present as well as former officials offering bumper-sticker slogans like “If you have nothing to hide, you have nothing to fear,” all the while claiming our freedom is in direct conflict with our security. True, if perhaps you put “legal” in quotes. After all, so was slavery once upon a time in the US and apartheid in South Africa. Laws represent what a government and sometimes perhaps even a majority of the people want at a given point in time. They change and are changeable; what once was a potential felony in Colorado is now a tourist draw. Laws, manipulated for terrible ends, must be challenged when they come into conflict with the fundamental principles and morals of a free society. Laws created Nelson Mandela, the terrorist (whom the US kept on its terror watch list until 2008), and laws created Nelson Mandela, the president. The panel of experts appointed by President Obama to review the Snowden revelations and the NSA’s actions had a peek into the issue of “legality” and promptly raised serious questions—as did one of the two federal courts that recently ruled on some aspects of the issue. If the Obama administration and the Justice Department really believe that all the NSA’s activities will be proven legal in a court of law, why not allow them to be tested openly and unambiguously in public? After all, if you’ve done nothing illegal, then there’s nothing to hide. When Amnesty International first tried to bring such a question before the courts, the case was denied because that organization couldn’t prove that it had been subject to monitoring—that was a secret, of course!—and so was denied standing even to bring the suit. Snowden’s revelations seem to have changed all that. The documents made public have given “standing” to a staggering array of individuals, organizations and countries. For the first time in twelve years, they pave the way for the issue to come to its proper venue in front of the Supremes. Openly. Publicly. Keep in mind that the definition of “wrong” can quickly change. And if you don’t know what the actual law really is, how can you say that you know you have done nothing wrong? If you’ve got nothing to hide, post your social security number and credit card information online, leave your curtains open at night and see how that sits with you. The Fourth Amendment came into being because of the British use of general warrants in the colonial era. Under that “law,” they could legally search whole groups of people, their possessions and their papers without having to justify searching any specific person. Called “writs of assistance,” these general warrants allowed the King’s agents to search anyone, anytime, regardless of whether they suspected that person of a crime. The writs were most often used by Royal Customs agents (an irony perhaps, given the draconian powers now granted to US Customs agents to search anyone’s personal electronics, including those of American citizens, at the border). The US fought a revolution, and James Madison wrote the Fourth Amendment, against broad government authority to search. Whether you personally do or do not have anything to hide is not even a question that should be on the table. It should be almost un-American to ask it. Metadata is important. Ever play the game “Six Degrees of Separation”? Silly as it seems, almost anyone is indeed just six hops away from anyone else. You know a guy in Detroit who has a friend in California who has a sister who cuts hair whose client is Kevin Bacon’s high school classmate’s cousin. You and that cousin are connected. Publicly available information tells us that the NSA traces “three hops” from a target: A knows B, C and D. But once C morphs into a target, C’s three hops mean the NSA can poke into E, F and G and so forth. The Guardian calculated that if A has fifty friends, the number of targets generated under the three-hop rule would be over 1.3 million people. I really do hope that you (and everyone you know, and they know) have nothing to hide. The Patriot Act elevated a once rarely used tool, the National Security Letter (NSL), into the mainstream of government practice. National Security Letters are an extraordinary search procedure that gives the FBI the power to compel the disclosure of customer records held by banks, telephone companies, Internet service providers, public libraries and others. These entities are prohibited, or “gagged,” from telling anyone about their receipt of the NSL. Though the Justice Department itself cited abuse of the letters by the FBI in 2008, in 2012 the FBI used 15,229 National Security Letters to gather information on Americans. NSLs do not require judicial approval and the built-in gag orders prevent anyone from seeking judicial relief; indeed, most people will never even know that they were the subject of an NSL. And at the moment, the Department of Justice is trying to keep classified an eighty-six-page court opinion that determined the government violated the spirit of federal surveillance laws and engaged in unconstitutional spying. Director of National Intelligence James Clapper directly lied to that check-and-balance branch of the government, Congress, in a public session. (He later termed his response the “least untruthful” answer.) And we wouldn’t even know that he lied, or much of anything else about the NSA’s surveillance activities here or globally, if it weren’t for one man’s courage in exposing them. The government had kept it all from us for twelve years and never showed the slightest sign of reconsidering any part of that policy. Without Snowden, we would not even know what needs checking and balancing. Do you really trust all of them all the time to never make mistakes or act on personal grudges or political biases? History is clear enough on what former FBI director J. Edgar Hoover did with the personal information he was able to collect on presidents, the Supreme Court, Congressional representatives, Martin Luther King and others in the civil rights movement. Among other things, he used his secretly obtained information to out gay members of government. As for the NSA, so far it hasn’t even been willing to answer the question of whether it’s been spying on, surveilling, or gathering metadata on members of Congress. Still, let’s assume that Obama or the next president or the one after that will never do anything bad with your personal data. Once collected, however, that data potentially exists forever. If the NSA is to be believed, it claims to hold metadata for only five years, though it can keep copies of intercepted communications from or about US citizens indefinitely if the material contains “significant intelligence” or “evidence” of crimes. 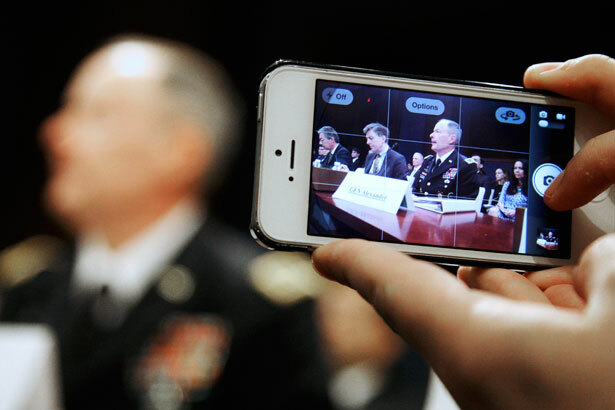 The NSA can hold on to your encrypted communications as long as is needed to break the encryption. The NSA can also keep indefinitely any information gathered for “cryptanalytic, traffic analysis, or signal exploitation purposes.” Data held is available to whoever can access it in the future, using whatever technologies come to exist. Trusting anyone with such power is foolish. And as for data security, we know of at least one recent instance when more than 1.7 million highly-classified NSA documents just walked out the door. At least in theory, it’s your choice to give data to private companies. You could stop using Facebook, after all. You can’t, however, opt out of the NSA. About the worst that Facebook and the others directly want is to take your money and send you spam. While certainly no angel, Facebook can’t arrest you, put you on the No-Fly list with no recourse, seize your property or put you under investigation, audit your finances, imprison you without trial as a terrorist, or order you assassinated by drone. Facebook can’t suspend your civil rights; the government can. That is a big, big difference. And by the way, a proposed solution to the metadata collection problem—having private companies, not the NSA, hold the data—is no solution at all. Data stored and available to NSA analysts, wherever it is, is data stored and available to NSA analysts. The Constitution and the Bill of Rights have matured with our nation, growing to end slavery, enhance the rights of women and do away with Jim Crow and other immoral laws. The United States survived two world wars, the Cold War and innumerable challenges without a massive, all-inclusive destruction of civil rights. Any previous diversions—Abraham Lincoln’s suspension of habeas corpus during the Civil War is a favorite instance cited—were short, specific and reversed or overturned. The Founders created the Bill of Rights to address, point-by-point, the abuses of power they experienced under an oppressive British government. (Look up the never-heard-from-again Third Amendment.) A bunch of angry jihadis, real and imagined, seems a poor reason to change that system. From 1776 to 2001 the United States did not experience a terror attack anywhere close to the scale of 9/11; the worst terror attack against the United States as of 9/10, the Oklahoma City bombing, claimed 168 lives compared to some 3,000 at the Twin Towers. Since 9/11 we have not had a comparable mass-scale terror attack. No dirty bombs at the Super Bowl, no biochemical nightmares, no suicide bombers in our shopping malls or theme parks. There have been only about twenty domestic terror-related deaths since 9/11. Your chances as an American of being killed by a terrorist (the figures are for the world, not just inside the US) are about 1 in 20 million. The inevitable comparison shows the odds of being struck by lightning at 1 in 5.5 million. You are, in other words, about four times more likely to be struck by lightning than killed by a terrorist. Most of the “terrorists” arrested in this country post-9/11 have been tragicomic fabrications of the FBI. 9/11 was a one-off, an aberration, so unique that its “success” stunned even Osama bin Laden. It was a single morning of disaster and cannot be the justification for everything the government wishes to do forever after. At the same time, despite all this intrusion into our lives and the obvious violations of the Fourth Amendment, the system completely missed the Boston bombers, two of the dumbest, least sophisticated bro terrorists on the planet. Since 9/11, we have seen some 364,000 deaths in our schools, workplaces and homes caused by privately owned firearms, and none of the spying or surveillance identified any of the killers in advance. Maybe we should simply stop thinking about all this surveillance as a matter of stopping terrorists and start thinking more about what it means to have a metastasized global surveillance system aimed at spying on us all, using a fake argument about the need for 100 percent security in return for ever more minimal privacy. So much has been justified in these years—torture, indefinite detention, the Guantánamo penal colony, drone killings, wars and the use of Special Operations forces as global assassination teams—by some version of the so-called ticking time bomb scenario. It’s worth getting it through our heads: there has never been an actual ticking time bomb scenario. The bogeyman isn’t real. There’s no monster hiding under your bed. 10) But doesn’t protecting America come first—before anything?